Welcome to Baldwin Bagels & Bakery! Choose from our selection of breakfast items, sandwiches, wraps, gourmet salads, specialty sandwiches, & much, much more! Click on the Order Online tab above and we'll have your order ready when you arrive. And be sure to make use of our advance order feature to ensure that your food is ready exactly when you want it. Baldwin Bagels was established as a family business providing a wide variety of the best hand-rolled bagels in the area. We are committed to providing excellent service, not only for our bagels but also for our appetizing salads, sandwiches, breakfast, lunch and individualized catering orders. 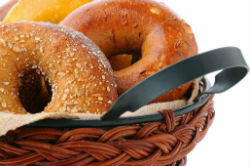 Baldwin Bagels, has the finest assortment of cakes, pastries, muffins, and cookies.